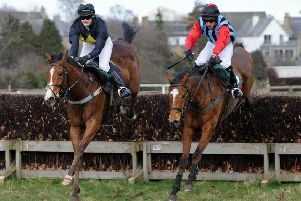 Martila in action at Kelso. The in-form jockey started his winning spree when scoring on Martila for Northumberland trainer Pauline Robson in the £20,000 Kristofferson Carpets & Flooring Handicap Hurdle. Quinlan also took the £25,000 William Hill Leading Racecourse Bookmaker Handicap on Sandy Thomson’s Dimple, who produced a stunning, front-running, jumping performance to score by 20 lengths from three-time Kelso winner Mount Mews. Achill Road Boy was another winning spare ride for Quinlan as he replaced Selkirk’s Sam Coltherd in the Trial Racing TV For Free Now Handicap Chase. Choochoobugaloo won the Mares Handicap Hurdle in convincing style and Bernard Henry, representing the Sam England Racing Club, was visiting Kelso for the first time. Warren Greatrex, also making the trip for the first time, trained Encore Champs to see off Lord Yeats in the Tarrag Naegel Novices’ Hurdle. The Upper Lambourn trainer said: “I’ve had a winner here before but this is my first visit. It’s a lovely little track and I’m very impressed with what I’ve seen. 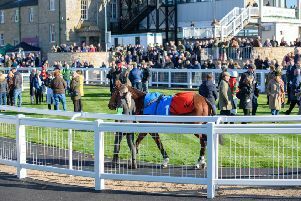 Greatrex could return to Kelso sooner than that, as he and owner Ray Green are plotting to scoop another value prize at the next meeting – thsi coming Tuesday, January 22 – with Mahlervous in the £20,000 feature race, a Class 2 handicap hurdle. The first of seven races gets under way at 12.55pm, with gates opening at 11am. The racecourse management team will also be collaborating with local schools and the Borders College, through Developing The Young Workforce Borders, to give a behind-the-scenes tour of the racecourse before gates open and an insight into the career opportunities available in the horseracing and hospitality industries.